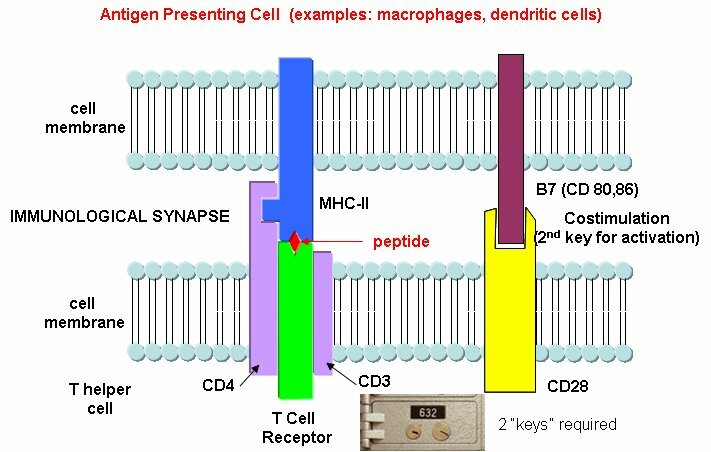 Antigen presentation by MHC molecules on activated macrophages and dendritic cells is a bit complicated. Class I MHC proteins are found on most human cells. They present peptides (hot dogs) in the grove (buns) of the MHC protein. It turns out that not only are foreign peptides (from virus proteins for example) are presented, but also self peptides. All these peptides are generated by intracellular proteolysis of proteins - self and nonself by a structure in the cell called a proteasome. Sompayrac suggests that the MHC Class 1 proteins are like "billboards [which] advertise a sampling of all the proteins that are being made in a cell". MHC Class 1 molecules present information about proteins made in the cell. They activate cytotoxid T Cells, CTLs, which can kill the altered cell. Cytotoxic T cells have another protein CD8, which binds to its T cell receptor. The CTL must also have a second nonspecific signaling protein (as mentioned above in the safety deposit box analogy) for cell activation. Class II MHC proteins are found on immune cells (macrophages, etc) which present antigen to T cells, especially T helper cells. They present information about proteins found outside of the cells (such as on bacteria) but whose proteins might end up inside the antigen presenting cell like a macrophage. They activate T helper cells which, through release of signaling molecules called cytokines, activate other immune cells. B cells, before activation by antigen, express little MHCII proteins (and small amounts of B7). After activation, they express more of these proteins and can activate T helper cells. T helper cells and CTLs differ in another way. T helper cells have another protein CD4, which binds to its T cell receptor, while CTLs have the protein CD8 bound. Both cells must also have a second nonspecific signaling protein (as mentioned above in the safety deposit box analogy) for cell activation. Class I MHC (found on most body cells): T cells need to be able to see what is going on inside the cell. 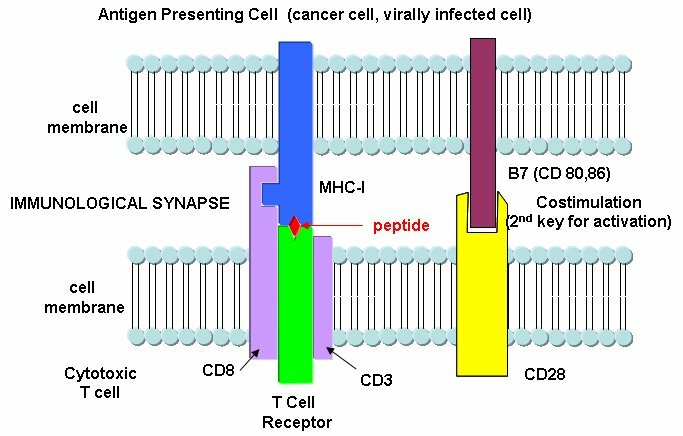 When virally-infected cells bind foreign peptide fragments and present them on the surface, they can be "seen" by the appropriate T cell. It's a way to get a part of the virus, for example, to the surface. They can't hide out in the cell. T cells don't need to recognize extracellular threat since antibodies from B cells can do that. Presentation is also important since viral protein fragments that might be found outside of the cell might bind to the outer surface of a noninfected cell, that would then be targeted for killing by the immune system. That wouldn't be good. It also helps that peptide fragments are presented on the surface. This allows parts of the protein that are buried and not exposed on the surface, which would be hidden from interaction with outside antibodies, to be used in signaling infection of the cell by a virus. MHC Class II (found on antigen-presenting cells like macrophages): In this way two different cells (the presenting cell and the T helper cell) must interact for a signal for immune system activation to be delivered to the body. Again it is a safety mechanism to prevent nonspecific activation of immune cells. Also, as in the case above, since fragments are presented, more of the foreign "protein" can contribute to the signal to activate the immune system.